In addition to our energy design analyses, we perform the mandatory testing and inspecting for the 2012 IECC. Why choose Desert Skies Code Compliance for your testing and inspecting needs? Price: Our pricing is competitive; you'll likely be able to find quotes that are more expensive and less expensive. Our quality of work, reliable scheduling and expertise separate us from the competition. You get what you pay for. Scheduling: Next day scheduling is available! We offer Valley-wide testing... from Scottsdale to Peoria to Queen Creek and everywhere in between. Customer Service: We do things others don't... like call the project superintendent before arriving on site. We are respectful-- we don't leave trash on your job site or and are extra careful while working in finished homes. Reports: We offer same day reporting to deliver to your building official to prevent any holdups in construction or receipt of Certificate of Occupancy. And what if I fail? If your test results exceed the standard set by the IECC, we will diagnose the problem on site for you and tell you exactly how to repair it. If the experts can't tell you how to fix the problem, how are you supposed to fix it? Often times, we can help you fix the problem on site and you'll avoid a reinspection fee. This is the kind of service you can expect from us. What tests and inspections do I need? Air Barrier Inspection: Unless your city building inspector tells you otherwise, you should have the thermal envelope inspected by a HERS Rater. We like to call this an "insurance policy" because if there are deficiencies at frame, we will find them at our final inspection in a finished home. 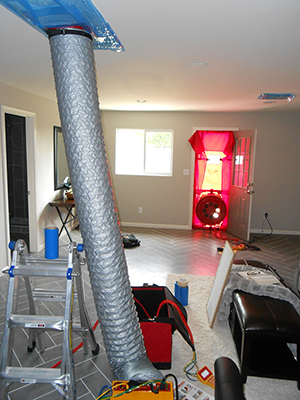 This inspection is performed at the same time as the duct testing (just before insulation). Insulation Inspection: Although required by the code, many municipalities will inspect this portion themselves. It is often a good idea to have a HERS rater inspect the insulation, however, especially if you are using fiberglass batts (known for serious performance problems). Duct Testing: Required for all duct systems unless the air handler and duct system is located within conditioned space. For example, a home with a spray foam roof deck and air handler in the sealed attic would be exempt from this requirement. Envelope Leakage Testing: The last item needed in order to obtain your Certificate of Occupancy! Also known as blower door testing, there are no exemptions to this test. Every home must meet an air tightness standard of 5.0 ACH50 which is based off cubic volume. Don't worry, we'll do the math for you. What are your rates and how can I schedule a test? Our rates are customized in order to be extremely competitive so the best way to get a quote is to give us a call at 480.489.2692. We'll get you a proposal ASAP so we can get to work the very next day.